Roderick Davis is the Music Director and Lead Drummer of Ezibu Muntu. He was introduced to the dance company in 1994 by one of his mentors and original member of the Ezibu, Renee Knight. Roderick has been an active member of the company dedicating 20 plus years of studying and sharing his knowledge of West African Djembe music. Mr. Davis has a Bachelor’s of Science degree in Architectural Drafting & Design from Virginia State University and an Advanced Certification in Principles of Engineering from Duke University. He has taught Technology Education, Pre-Engineering and Basic Architecture at MLK Middle School for 8 years, also starting a West African Music program after school at MLK Middle. Roderick is currently the Lead Teacher for Richmond Public School’s Governor’s Engineering Academy at RTC for 3 years now. 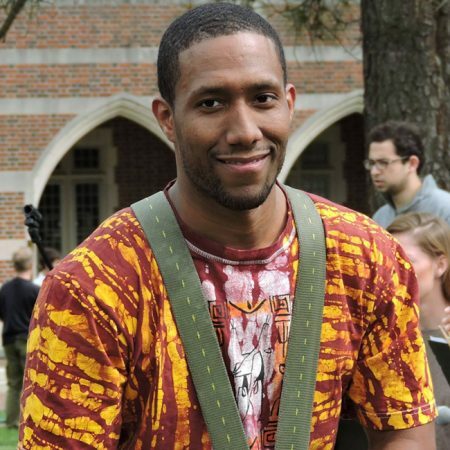 He is also an adjunct professor of West African Djembe music and history at University of Richmond. He mentors under-served youth centered around teaching them West African music, and he also volunteers teaching music therapy to adults and children with various cognitive disabilities in Richmond and surrounding counties. Roderick is also the co-founder of Capoeira Resisténcia Richmond with world renown capoeira master, Mestre Panão in 2005. Mr. Davis is now the group’s first graduated American Instructor of capoeira and is now teaching this Brazilian martial art form in Charlottesville VA.
Template crafted by NRAEIO, LLC.